If you have a website and it’s attracting a lot of visitors every day for its extraordinary content, you might be wondering – hmm, how about I turn visitors into customers? Well, the answer is simple “subscription”. You may also call it a membership site! It creates a special bond of trust and loyalty between subscriber and site owner when subscribers receive a unique content for their money. The site owner draws more traffic because they create content for restricted users. Thus, people get more interested to subscribe if they are already reading the material. Creating a subscription-based website doesn’t require coding knowledge these days since you have WordPress! In this article, we will discuss how to set up a membership site or subscription website. Follow the step by step guide and you will be done within a short period of time. First, you have to create a WordPress site. Building WordPress site is one of the easiest tasks in the web. If you are not familiar with WordPress, follow the links below to set up your WordPress site. Now that you have your WordPress site up and running, you need an appropriate plugin for your subscription package. 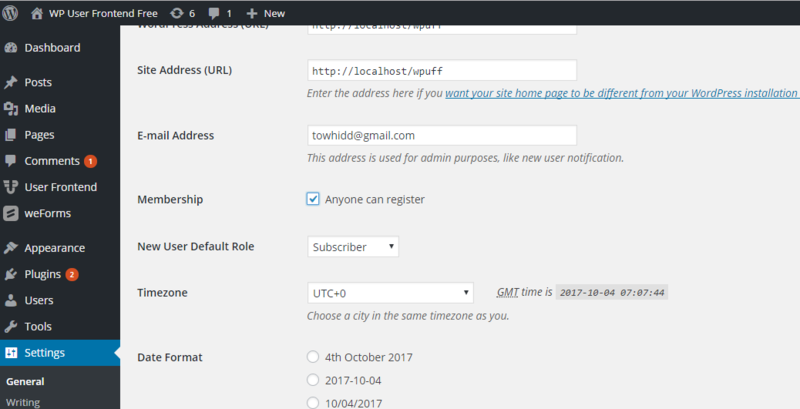 WP User Frontend is a great plugin that will allow you to set subscription into your site. Install WP User Frontend in your site. For that, go to – wp-admin → Plugins → Add New → Browse the plugin from your computer. Click install and Activate the plugin. After you have installed WP User Frontend, you can start building your subscription packages. 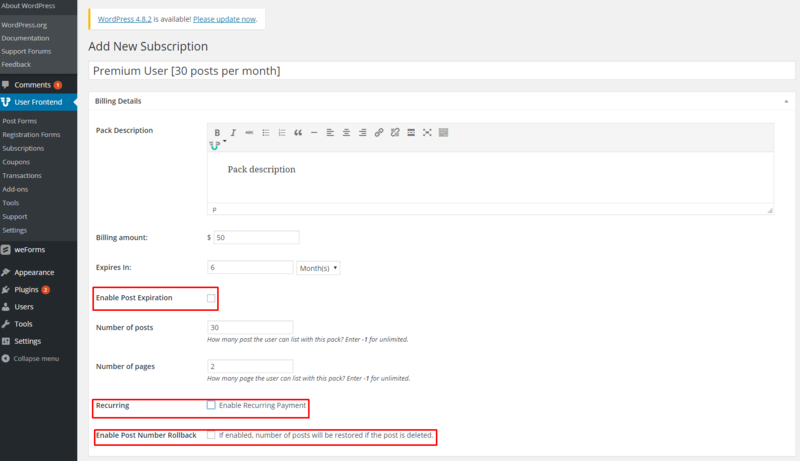 WP User Frontend comes with subscription features, like pay per post, locking contents and guest posting. You can choose and create combinations of these features. For creating your subscription packages, you have to navigate through wp-admin → User Frontend → Subscriptions → Add Subscription. This screenshot above shows a subscription pack when it is being created. Almost everything is straight-forward, except the red bordered three checkboxes. These checkboxes hold some additional features that are revealed only when you check them. Here you can set or define how much money you are going to charge for posting [billing information], when is the expiration date of this package after buying, how many posts the subscriber can publish and how many of pages can she/he use. Okay! I know what you are thinking, yes, the red bordered checkbox! Check the “Enable Post Expiration” and see it is a lot similar to this image: You can see the four new items show up for your “Enable Post Expiration” feature. 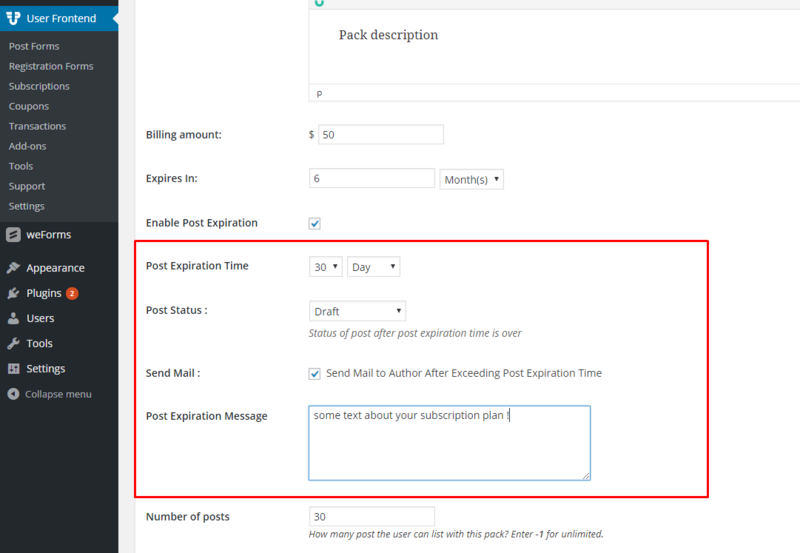 You can set how long you will show a post on your site, send emails to the particular user about the expiration of post and you get to define what holds in the future of the expired posts. With so many features and your clever business ideas, you can have a large number of “writer subscribers” [ who will post into your site]. Now let's see what is hiding behind “Recurring”. 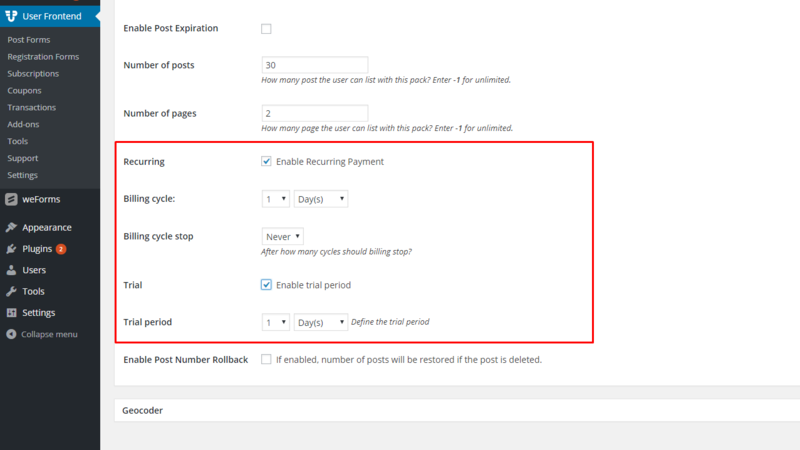 After you check the checkbox you will see some additional features regarding “Recurring”. Recurring means if you want your subscribers to keep purchasing one of your specific subscription pack. If so, then when it should stop billing your subscriber. Also, there is a trial period, if you wish to provide a free trial of your subscription packs and you can later convince your visitors to buy your subscription package. Imagine you have purchased any of my subscription pack in which you are allowed to publish 10 posts per month. You have used up all your slots and there are already ten posts you have published. Suddenly you need to post one very very important post. What will you do now? Well, you can delete any of your previous posts and post one last very important article. If I check this checkbox, you will see the update of how many posts you have left, if you delete any post after completing your allowance. A wise combination of all these sections distributed into multiple packages can create lots of different subscription packages, which will open multiple business opportunities for you. What a great plugin, right! Say you have successfully persuaded someone to buy your subscription package, so how will they register into your site in order to buy a package? WordPress has solutions for your problem. To get your users register into your account, follow this path: wp-admin → Settings → Check anyone can register. 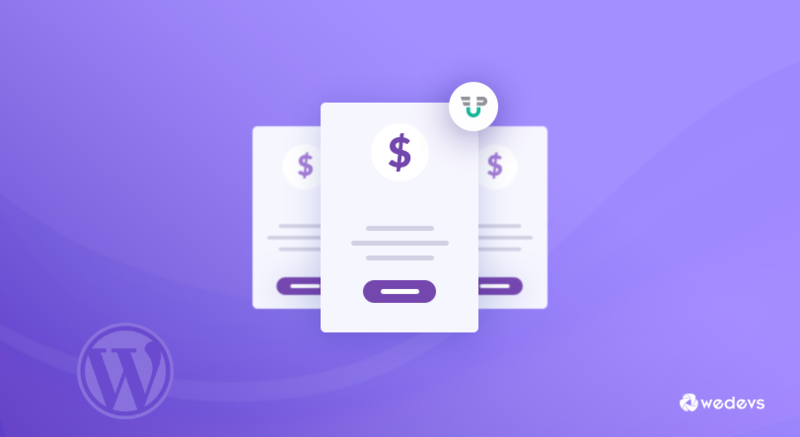 Your users need to complete payment in order to buy a subscription pack. So for payment go to : wp-admin → User Frontend → Settings → Payment. Here you have to do some important tasks to get your subscribers. Every option in the payment section is described below. By enabling this feature you will get all your subscription packs on a specific page. When you install and activate this plugin, you will get some already created pages, among them there is a page called “subscription” that has a shortcode [wpuf_sub_pack]. 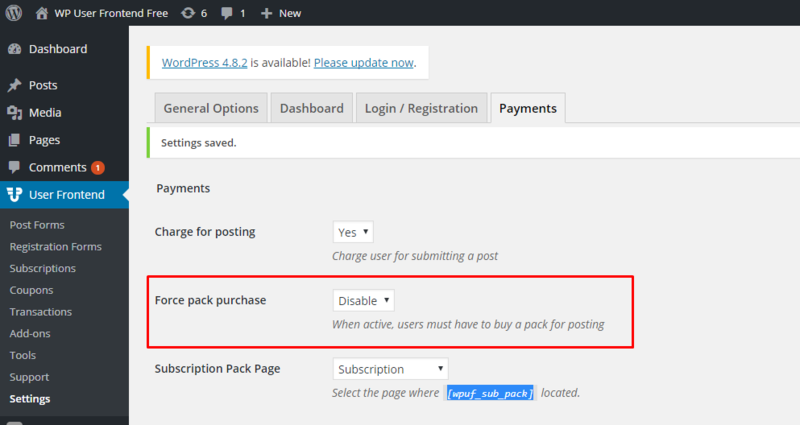 When you select “yes” for charge for posting, you will see all your created subscription packages on the page called “Subscription Pack Page”. If “no” is selected, you cannot see any subscriptions. It is noteworthy here that, you can show all your subscriptions in any page by using the shortcode [wpuf_sub_pack]. The screenshot is right here: Set “yes” for Charge for Posting and save. This is a tricky feature where you can force any of your visitors to buy a subscription pack in order to post on your site. You can make your users subscribe when they want to register by checking the checkbox. 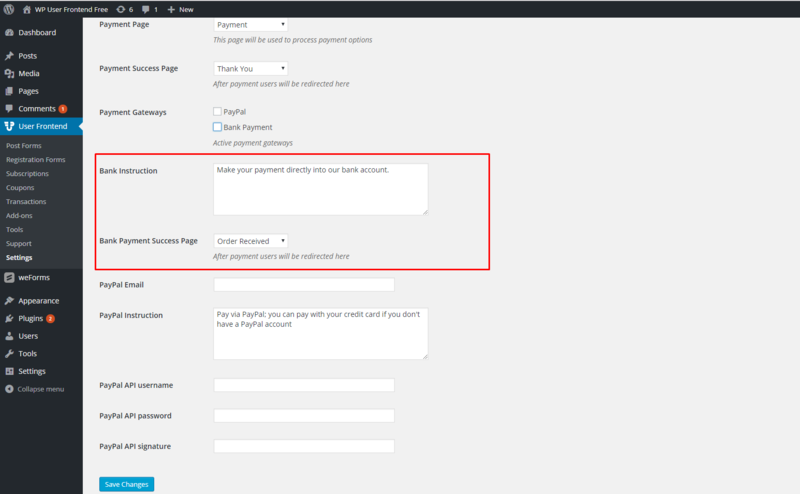 Everything about currency is on your wp-admin → User Frontend → Settings → Payment section. You can set the money and symbol position, set position for thousand by comma and decimal by a decimal point. These pages are already set when you install WP User Frontend, you don't need to do anything here. If you want you can create your own custom page and set those here. With WP user frontend, your subscribers can pay you through PayPal or by direct Bank Payment. For paying through PayPal, you need to add your PayPal email address, username, API and the signature in the appropriate position in WP User Frontend → Settings → Payment. Since PayPal is integrated with WP user frontend, you don't need to install any other extensions. It's important to note that, everything related to PayPal will work only if the sandbox mode is unchecked. There you go. Your subscription-based membership site is ready for business. There are two extra features that you might want to learn about from WP User Frontend. Using these features wisely, you can run a successful business with your subscription based membership site. Let's assume you want guests to post on your site, without registration or logging in. So you have to enable your guests to post in your site. Navigate through: wp-admin → User Frontend → Post Form → Choose any form → Settings → Check “Enable guest posting”. Let's be honest, these days online business has spread out a lot more than blogs or personal websites. People are always online and Email marketing is gaining popularity. Because it's all about drawing more and more visitors. The more visitors you have, the more opportunities you have, it's that simple. For this reason, user-frontend has some extensions through which you can allow your subscribers of different email marketing platforms to learn about your posts and other contents in your website. Some of these extensions are BuddyPress Profile Integration, MailChimp, and MailPoet Integration. That's all! Start your online business today with WP User Frontend and create a WordPress Membership Site that everyone will like! Mushrit Shabnam is a support engineer and works closely with customer issues. Apart from being a support engineer, she enjoys coding, working with WordPress, learning about new technology, drawing and also music. We appreciate that you liked our post. Do visit our blog regularly for more awesome posts like this one. This is great and really timely for me as I’m considering starting a membership site in the parenting field. Congratulations Nathalie on your pregnancy. I’d love to know what parenting forums you’ve discovered that have been helpful to you. Thanks! How do I add a carry forward option ? best web design service to mmake youyr small business site.